A reader saw my technical analysis (TA) for ComfortDelgro and asked if I did the same for SingTel? "Please share your TA for SingTel." Since going XD, SingTel saw its share price plunging but I don't think this has anything to do with its business fundamentals which do not seem to have deteriorated enough to warrant the huge decline in price. If the fundamentals at $3.79 a share are the same as the fundamentals at $3.58 a share, logically, what should someone who was buying at $3.79 do now? Having said that, price movement is sentiment driven most of the time and this is what we call "volatility". There is no accounting for prices and Mr. Market does not care what we think. For those who bought at a much higher price only to "cut losses" now, I only hope they do not regret later on. If I were in their shoes, I would ask if I did not buy at those higher prices, would I be buying now? This question will probably yield a more rational answer. Well, it has always worked for me. To be fair and also to be rational, what they do depends on their motivation for buying into SingTel when they did. Always remember that TA is about probability and not certainty. It is quite clear to me that there is support at $3.58 a share but it is not a strong support per se. The Fibo golden ratios are at $3.53, $3.49 and $3.45. These supports might or might not be tested but if the downtrend should persist, these are the prices which could see me accumulating. In terms of momentum oscillators, both MFI and CMF are pretty benign which suggests to me that the bears might lack the strength to push the price much lower although the huge gap down in price is bearish and that is what the MACD reflects. Although I believe that investing in SingTel at $3.58 provides value for money and that money isn't flowing rapidly out of the stock, it might not be a good idea to throw in everything including the kitchen sink at this point either. I anyhow talk to myself only. I blur. Current MACD is below signal line and RSI below 50. Current closing price $3.59 is also below 20 50 100 DMA. Low can get lower, high can get higher. the trader/investor needs to analyse the following actions, buy hold sell short wait and not focus only on a single action to anticipate price movements. Everybody should have a plan, their own plan. It is never a good idea to ride on someone's coat-tail. I went into the minute buying and suspect price are dropping us because traders are pushing it down to triggers people stop-loss which tend to set just below the 52 week low. Once triggered, many sold down and then the price rebounced yesterday. Just my observation. With the increase of interest rates, i felt it is the right move to move my funds into blue chips( i am quite reits heavy too) and reduce some exposure in risker reits( eg: industrial reits) knowing the landscape is going to be tough in the coming years. That is my plan hopefully it works out for me. I am not a professional chartist either. So, take it with a pinch of salt or two hor. -.-"
Hohoho merry X'mas. I donn't have Sabana in my portfolio but if needed to reduce a bit on Aims Amp (previously was my biggest holdings). FA/TA depending on which make sense to me and depending if i am trading or investing. I like to think of myself as a TA guy. However, the sad truth are my investment/mid-term trades has been positive but same cannot be said for my short term trades, contra, etc. Those have been horrendous! Imagine losing more than your annual passive income :P hence why I have been much focus on generating passive income with the help of TA. Holistic approach to secure financial future. Now, how to reduce income tax? I would keep any investment in Starhub relatively small. Hi AK, thank you for the reply. I appreciate it when you're so busy. 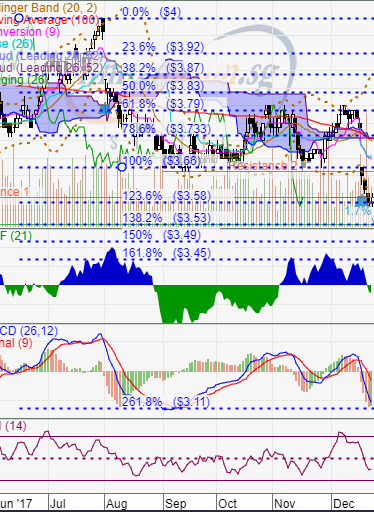 I invested in Singtel at a much higher price of 3.86. Singtel is facing a lot of headwinds from decreasing revenues and the 4th telco coming into Singapore. Business prospects don't look at good. Why are you still so confident? Singtel is transforming. It is stronger and more resilient today. SingTel is not M1 nor Starhub. Also, if you take a look at where the headwind is strongest, it is in Singapore and in the consumer business. This is a small portion of their business. The overall picture is not all bad. I don't remember saying $3.19 was good but I do remember saying $3.11 was a support. For sure, whether the support would break or not no one knows. I do know for sure that as SingTel's share price goes lower, it becomes better and better value for money. why not buy when there is a trend reversal from down to up instead of catching falling knives? Of course one has to pay a higher price for the conformation. -_-"
Hi Ak, looking fwd to your sharing. Always enjoy your poetic wisdom and humor!